Objectives: To describe the motor and convulsive manifestations in acute sports-related head injury. 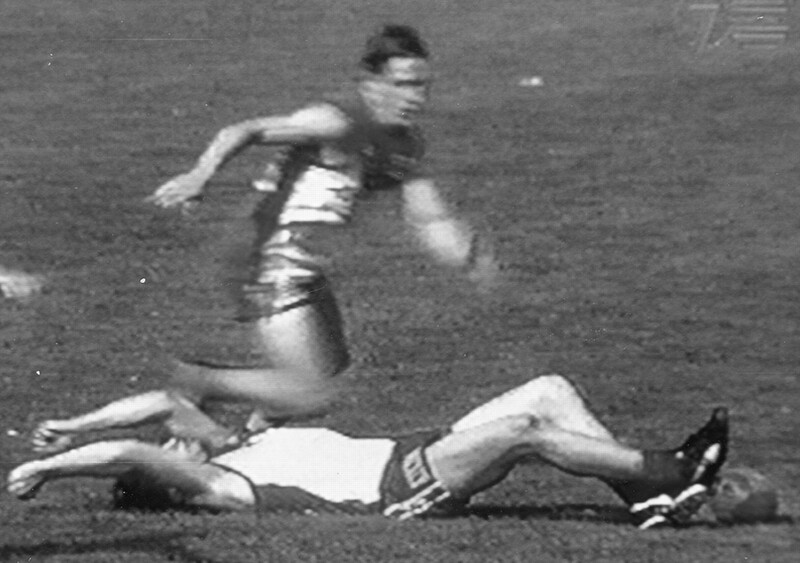 Methods: A total of 234 cases of concussive injuries during the 1995 through 1997 football seasons were obtained from the Australian Football League Medical Officers Association injury survey. Of these, 102 cases were recorded adequately on television videotape and were analyzed by two independent observers using a standardized recording form detailing injury mechanics and clinical features of the episodes. Motor and convulsive features were correlated with mechanical variables and with duration of loss of consciousness using linear modeling techniques. Results: Tonic posturing occurred in 25 subjects, clonic movements in 6, righting movement in 40, and gait unsteadiness in 42. In one subject the tonic and clonic features were sufficiently prolonged to be deemed a concussive convulsion. The only risk factor for tonic posturing using logistic regression was the presence of loss of consciousness (p = 0.0001). There was a trend toward facial impact being an independent predictor of tonic posturing but this did not reach significance. No other independent variable predicted the development of clonic movements, righting movements, or gait unsteadiness. Conclusions: Subtle motor manifestations such as tonic posturing and clonic movements commonly occur in concussion; the main predictive factor for tonic posturing is the presence of loss of consciousness. The authors speculate that these clinical features are due to brainstem dysfunction secondary to biomechanical forces inducing a transient functional decerebration. The clinical motor manifestations of acute concussion in humans have not been described systematically. In a previous retrospective study we documented florid convulsive features as an occasional accompaniment of concussion.1,2 These were misdiagnosed as being epileptic in origin (concussive convulsions). In this study we analyzed prospectively the motor phenomena of human concussion to determine whether more subtle motor features could be an unrecognized phenomenon of acute concussive brain injury. We ascertained all cases of concussion from the elite national Australian football competition over a 3-year period comprising the 1995 through 1997 seasons. These football games are videotaped routinely by commercial television. Cases of concussion were identified from the Australian Football League Medical Officer’s (AFLMO) Injury Survey Database. Videotapes of each concussive event were sought from the television station and scrutinized in detail. The AFLMO database is a prospective survey of all injuries occurring to registered players in the elite professional Australian football competition. Injuries are diagnosed and recorded by club medical officers on a standardized form that is coded and entered into the database by a central registry. Integrity of the data are checked by comparison with independent insurance statistics. This database has been operating since 1992, and epidemiologic information has been published previously.3,4 We define concussive injury in terms of medically diagnosed and injury severity information such as duration of loss of consciousness (LOC), presence of retrograde and anterograde amnesia, or both. All clinical symptoms are recorded. The videotapes were analyzed by two independent observers using a standardized data record form that documents independent variables: impact awareness, attempted evasive maneuvers, anatomic impact site, impacting part of the body, the presence of a double impact, head movement postimpact, and presence and duration of LOC. The dependent variables recorded on this form were the presence of tonic posturing, clonic movements, righting movement, and gait unsteadiness. A consensus diagnosis was obtained and video information reviewed when necessary. Statistical analysis was performed using linear modeling techniques with the dependent and independent variables described earlier. Of these 234 cases of concussion, 102 cases were ana-lyzed. Cases were rejected when the impact and immediate postimpact period were obscured or visualized incompletely. In the table, the frequency of clinical features of concussion is recorded. LOC was measured on videotape as the period of unresponsiveness or absence of purposeful voluntary movement following impact. LOC was noted in 75 players. 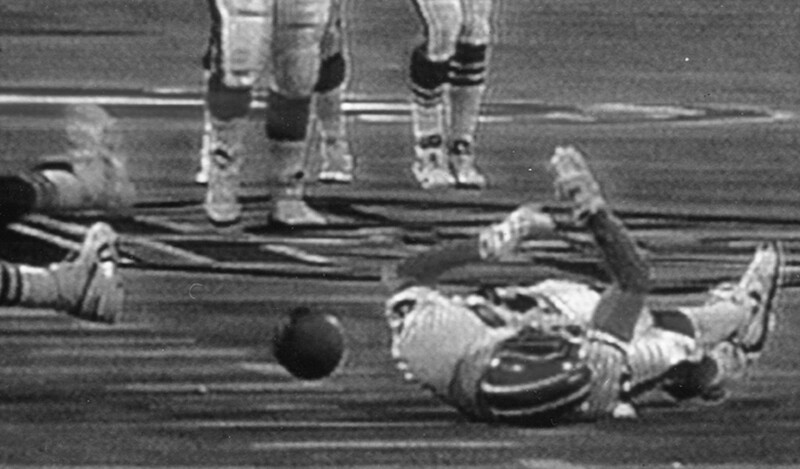 The players who were deemed not to have lost consciousness were dazed and could be described anecdotally as being “dinged” or “having their bell rung.” The duration of LOC ranged from 10 to 300 seconds, and 97 of 102 players were removed from the playing field immediately following injury. Tonic posturing characteristically involved tonic contraction of the proximal upper limb muscles, causing the abduction and elevation of semiflexed arms and shoulders in a “bear-hug” posture. The tonic posturing could involve other muscles such as the cervical, axial, and lower limb muscles. Tonic posturing was noted in 25 players, or one-quarter of all concussions, and varied in duration from 2 to 30 seconds (figure 1). Figure 1. Australian football player demonstrating tonic posturing in upper and lower limbs. Accidental facial impact by an opponent’s knee resulted in immediate tonic posturing as demonstrated. He had 4 minutes of loss of consciousness, had 45 minutes of post traumatic amnesia, and his postconcussive symptoms lasted 4 days. Clonic movements that comprised periods of asymmetric and irregular rhythmic jerking of axial or limb muscles were seen in six players and occurred only in association with the tonic posturing. In five players the clonus was brief (<10 seconds), but in one player it lasted 150 seconds and was regarded as a concussive convulsion (figure 2). Figure 2. An international rugby player demonstrating symmetric tonic posturing of the upper limbs and clonic movements of the left leg. Frontal impact occurred during a legitimate tackle. He lost consciousness for 60 seconds and his clonic movements lasted 30 seconds. He returned to the field after recovery and subsequently won the “man-of-the-match” award for best player in the game. Righting movements were defined as semipurposeful righting or attempts to return to an upright position in the setting of an unconscious player. Righting movements occurred in 40 players, or almost half of the observed cases of concussion. Gait unsteadiness was defined as an ataxic, stumbling, or unsteady gait with a tendency either to fall or to lose postural tone after concussive injury. This common feature, occurring in almost half of the players, was usually evident immediately postimpact. However, in six players it was delayed by 10 to 20 seconds after the player had regained his feet postinjury. No independent variable predicted the development of clonic movements, righting movements, or gait unsteadiness. The only risk factor for tonic posturing using logistic regression was the presence of LOC (p = 0.0001). There was a trend toward facial impact being an independent predictor of tonic posturing, but this did not reach significance. Using a forward stepwise Wald linear regression, a predictive formula for tonic posturing was calculated as logit (probability of tonic posturing) = −2.8 + 2.9 (LOC) + 1.1 (facial impact). The duration of LOC was broken down further into 5-second time epochs to determine whether a “threshold” level existed beyond which tonic sequelae were evident. The data showed that a duration of LOC of ≥ 60 seconds predicted the development of tonic posturing at p = 0.006, whereas LOC < 60 seconds was not a significant predictor of this outcome. There was no threshold relationship evident between duration of LOC and any of the other dependent variables. A typical tonic posture involves a sustained contraction of the proximal upper limb muscles in a “bear-hug” posture. The tonic posturing may also involve other muscles such as the neck and axial musculature, with versive head turning noted commonly. This tonic posturing has a virtually instantaneous onset, with players adopting the tonic posture as they fall toward the ground postimpact. In approximately 75% of players there are asymmetric features. The duration of the phenomenon may be brief, lasting only a few seconds; but in rare instances the clonic twitching can be sustained for several minutes. These phenomena are not limited to Australian football. Figure 3 shows an example of such a case in American football. Figure 3. American professional football player demonstrating upper limb tonic posturing as well as versive movement of the head to the right. This player sustained a helmet-to-helmet contact while receiving the ball during a play. The impact site was the left temporal region. He had tonic posturing that lasted 45 seconds (shown here) and loss of consciousness of 2 minutes. Risk factors for these various phenomena are difficult to establish apart from tonic posturing, for which the presence and duration of LOC more than 60 seconds was noted to be predictive. There was also a trend that suggested that facial impact was important, although this did not reach significance. None of the other phenomena were linked to any predictive factors. The relatively small number of players and the likelihood of a type 1 error may, in part, explain this finding. We have hypothesized previously that the concussive impact itself creates a transient functional decerebration akin to the corticomedullary dissociation described in convulsive syncope.1,2 Early animal research on experimental brain concussion demonstrated immediate and profound disruption of brainstem function associated with vagally mediated vasomotor instability.19,20 In some cases the blows were associated with flexor spasms. Because the animals were anesthetized, the interpretation of these movements was limited. As evidenced by the various motor phenomena along with concussive convulsions, it is possible that the blow itself initiates this transient decerebration, resulting in the convulsive movements. Righting movements and gait unsteadiness were observed in 40% of players. The presence of LOC, particularly when prolonged, meant that the player was assessed medically on the field and then removed by stretcher with the appropriate precautions for cervical spinal cord injury. In such situations, the presence of righting movements was difficult to ascertain, and unsteady gait was impossible to assess. This meant that observation of the latter two phenomena were biased toward the “milder” cases of concussion (i.e., those with momentary or no LOC), whereas the tonic and clonic motor phenomena were a feature of the more severe injuries. We speculate that gait unsteadiness also involves a brainstem mechanism and may reflect a combination of factors including postural tone, and cerebellar and labyrinthine function. In a limited examination of vestibular function in several patients with this phenomenon, no clinical evidence suggesting abnormal function was noted. Traditionally, concussion is seen pathophysiologically as a unitary global process.9,25,26 Our observations, however, suggest that there may be a variety of mechanisms contributing to the clinical features of concussion. The well-recognized behavioral and memory dysfunction is probably due to basal forebrain and limbic insult. Brainstem dysfunction, particularly disturbance of the afferent connections of the ventral tegmentum including the mesencephalic reticular activating system, has been previously postulated, although this work has not been reproduced by other authors.27,28 In contrast, the motor features that are present in approximately half of the players may be due to isolated brainstem dysfunction. We speculate that different biomechanical forces on the head and neck may determine the particular clinical patterns seen in concussed individuals. This is supported by anecdotal reports of players in whom the motor and convulsive phenomena occurred without marked LOC. McCrory PR, Bladin PF, Berkovic SF. Retrospective study of concussive convulsions in elite Australian rules and rugby league footballers: phenomenology, aetiology, and outcome. BMJ 1997;314:171–174. McCrory P, Berkovic S. Concussive convulsions: incidence in sport and treatment recommendations. Sports Med 1998;25:131–136. Seward H, Orchard J, Hazard H, Collinson D. Football injuries in Australia at the elite level. Med J Aust 1993;159:298–301. Orchard J, Wood T, Seward H, Broad A. Comparison of injuries in elite senior and junior Australian football. J Sci Med Sport 1998;1:83–88. McCrory PR. Were you knocked out? A team physician’s approach to initial concussion management. Med Sci Sports Exerc 1997;29 (suppl):S207–S212. Jane JA, Rimel RW, Alves WM, Dacey RG, Winn HR, Colohan AR. Minor and moderate head injury: model systems. In: Dacey RG, Winn HR, Rimel RW, Jane JA, eds. Trauma of the central nervous system. New York:Raven Press, 1985:27–33. Lighthall JW, Dixon CE, Anderson TE. Experimental models of brain injury. J Neurotrauma 1989;6:83–97. Ommaya AK, Hirsch AE, Flamm ES. Cerebral concussion in the monkey: an experimental model. Science 1966;153:211–212. Ommaya AK, Carrao P, Fletcher FS. Head injury in the chimpanzee. Part 1: the biodynamics of traumatic unconsciousness. J Neurosurg 1973;39:167–177. McMillan MK, Thai L, Hong JS, O’Callaghan JP, Pennypacker KR. Brain injury in a dish: a model for reactive gliosis. Trends Neurosci 1994;17:138–142. Ommaya AK, Hirsch AE. Tolerances for cerebral concussion from head impact and whiplash in primates. J Biomech 1971;4:13–31. Maddocks DL, Dicker GD, Saling MM. The assessment of orientation following concussion in athletes. Clin J Sport Med 1995;5:32–35. Yarnell PR, Lynch S. Retrograde memory immediately after concussion. Lancet 1970;1:863–864. Yarnell P, Lynch S. The “ding” amnestic state in football trauma. Neurology 1973;23:196–197. Shores A, Marosszeky J, Sandanam J, Batchelor J. Preliminary validation of a clinical scale for measuring the duration of post traumatic amnesia. Med J Aust 1986;144:569–572. Barth JT, Alves WM, Ryan TV, et al. Mild head injury in sports: neuropsychological sequelae and recovery of function. In: Levin HS, Eisenberg HM, Benton AL, eds. Mild head injury. New York:Oxford University Press, 1989:257–275. Gronwall D, Wrighson P. Memory and information processing capacity after closed head injury. J Neurol Neurosurg Psychiatry 1981;44:889–895. Maddocks D, Dicker G. An objective measure of recovery from concussion in Australian rules footballers. Sport Health 1989;7 (suppl):6–7. Denny–Brown D, Russell WR. Experimental cerebral concussion. Brain 1941;64:93–163. Jackson J. Epileptiform seizures (unilateral) after an injury to the head. Med Times Gazette 1863;ii:65. Jackson J. Case of tumor of the middle lobe of the cerebellum: rigidity in cerebellar attitude—occasional tetanus-like seizures. BMJ 1871;ii:242, 528. Jackson J. Fits following touching the head. Lancet 1895;1:274. McCrory P, Bladin P, Berkovic S. The cerebellar seizures of Hughlings Jackson. Neurology 1998;52:1888–1890. Ommaya A, Rockoff S, Baldwin M. Experimental concussion. J Neurosurg 1964;21:241–265. Gennarelli TA. Mechanisms and pathophysiology of cerebral concussion. J Head Trauma Rehabil 1986;1:23–29. Goldberg E, Antin SP, Bilder RM Jr, Gerstman LJ, Hughes JE, Mattis S. Retrograde amnesia: possible role of mesencephalic reticular activation in long-term memory. Science 1981;213:1392–1394. Goldberg E, Hughes J, Matis M, Antis S. Isolated retrograde amnesia: different aetiologies, same mechanisms? Cortex 1982;18:459–462.